The prevalence of obesity has steadily risen in North America and Western Europe over the past 25 years. This has been linked to a parallel rise in all associated illnesses, mainly type II diabetes, hypertension, sleep apnoea, musculoskeletal disorders, respiratory and cardiovascular diseases. To adequately serve the purposes of prevention and treatment of obesity and its related diseases multidisciplinary Bariatric centres, ideally linked to Academic Centres are extremely important. Portugal has a scarcity of specialist Medical care in the interior of the country. In spite of the lack of published statistics it is estimated that the prevalence of obesity in these interior regions is at least as high as it is in the coastal areas where the main Medical Centres and the Classical Universities are located. To provide adequate care to the increasing obese population of this region a new multidisciplinary Bariatric Centre has been established in an area of the interior, connected to the Academic Hospital that is adjacent to the newly created Medical School of the University of Beira Interior.The population served by this area, designated as Cova da Beira is estimated as being 93,579. 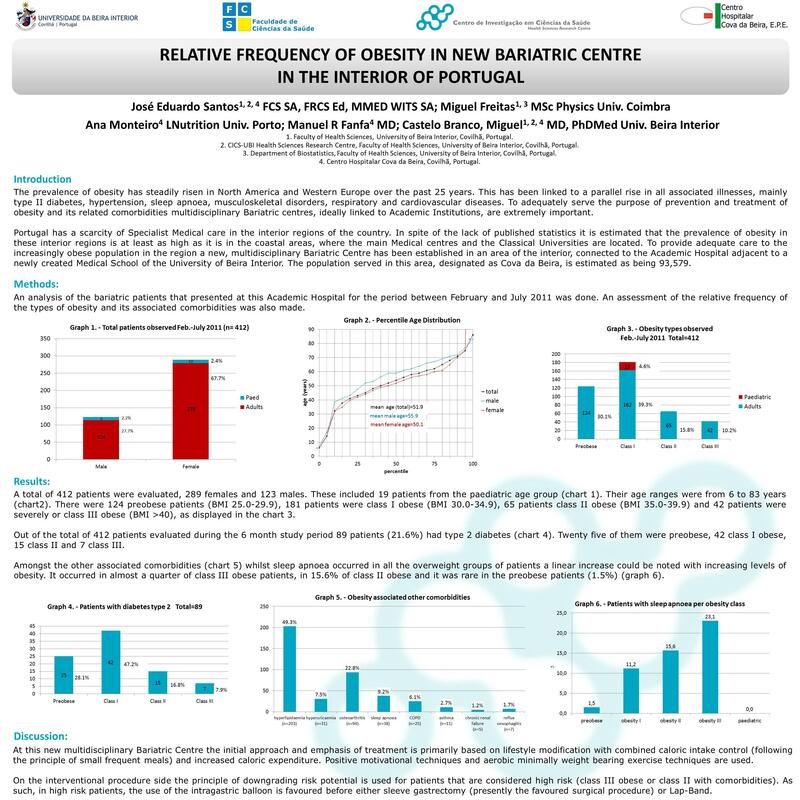 An analysis of the bariatric patients that presented at this Academic Hospital for the period between February and July 2011 was done. An assessment of the relative frequency of the types of obesity and its associated co-morbidities was done. A total of 412 patients were evaluated, 289 females and 123 males. These included 19 patients from the paediatric age group. Their age ranges were from 6 to 83 years. Of the 412 patients that were evaluated there were 124 patients that were classified as overweight (BMI 25-29.9), 181 patients were class I obese (BMI 30.0-34.9), 65 patients as class II obese and 42 as severely or class III obese, as displayed in the following chart. Out of the total of 412 patients evaluated during the 6 month study period 89 patients had Type II diabetes. Twenty five of them were overweight, 42 class I obesity, 15 class II obesity and 7 were class III obese, as shown in the adjacent chart. The emphasis of treatment is primarily based on lifestyle modification with combined caloric intake control (following the principles of small frequent meals) with increased caloric expenditure. Positive motivational techniques and the aid of aerobic minimally weight bearing exercise techniques being used. On the interventional procedure side the principle of downgrading risk potential is used for patients that are considered high risk (class III obese or class II with co-morbidities). As such the use of the intra-gastric balloon is favoured before either sleeve gastrectomy (presently the favoured surgical procedure) or Lap-Band.